Cost: The à la carte menu at Royal China Queensway contains a comprehensive variety of appetizers priced £5.50 - £9.20 while most main courses range from £10 - £26.50, with vegetables, noodles and rice dishes varying between £3 - £11. However, a few signature and seafood dishes can climb up to £45. The dim sum menu, which is served daily up to 5pm, features an excellent choice of dumplings, cheung fun, rice and noodle dishes ranging from £3.30 to £10.20. Royal China Queensway also serves a good selection of cocktails, Chinese teas and soft drinks. The wine list is very reasonably priced with a 175ml glass ranging from £5.80 to £6.95 and most bottles priced £19 - £45. About: Founded in 1996, Royal China Queensway was the first of what is now a very successful group of 6 restaurants in and around London. Widely regarded for its traditional dim sum creations and great Cantonese cooking and with branches in Baker Street (Royal China Club reviewed here and Royal China Baker Street reviewed here), Canary Wharf, Fulham and Harrow, the Queensway site remains the flagship of the group (reviewed here), always buzzing with members of the Chinese community, locals and food enthusiasts from further afield. The restaurant has a spacious, elegant interior decorated in black and gold which during the month of September is further embellished with lanterns hanging from the ceiling to celebrate the Mid-Autumn Festival also known as Moon (or Mooncake) Festival, this year celebrated on the 27th September 2015. What We Ate: Over the years, I have been to Royal China Queensway on countless occasions to savour their afternoon dim sum which I consider one of the best in London, but my latest visit was on a weekday evening when the à la carte menu is available. We started our meal with the deep fried soft shell crab with spicy salt (£8.50 for a portion of two). The fleshy soft shell crab was coated in a crisp thin layer of batter and topped with salty flakes of garlic, chilli, ginger and spring onion which provided a delicious contrast of textures. To follow, we tried the deep fried baby squid with spicy salt (£6.80). Prepared in the same fashion as the crab (we were in the mood for some deep-frying that night), it was perfectly cooked and equally delicious. Moving on to the main courses, I could not help ordering one of my favourite Royal China specialities, the baked seafood rice with creamy Portuguese sauce (£12.00). The exact ingredients are carefully guarded by the chef but this is a delightful dish of egg-fried rice with generous pieces of fish, scallops and whole tiger prawns topped with a creamy béchamel-like coconut and evaporated milk sauce, delicately flavoured with what might be a light curry or even semolina. This is a dish only available at Queensway and it is sadly not included in their printed menu so if you would like to try it, please ask your waiter for it. From the Chef’s specials we opted for the pan-fried stuffed aubergine with minced shrimp paste and black bean sauce (£11.20). A traditional Cantonese dish sometimes served with stuffed tofu and peppers, these were wonderfully soft aubergine pockets filled with a generous layer of shrimp paste, another excellent dish. In order to add a bit of spice to our meal we ordered the sautéed prawns with red chilli sauce “Szechuan Style” (£13.50). This dish was however disappointing - the fleshy prawns were let down by a gloopy and sweet sauce that lacked any heat or depth of flavour usually the trademarks of Szechuanese cooking. Our last meat-based dish was the chicken with chilli in “Chiu Chow style or Teochew Style” (£10.80). These were stir-fried strips of chicken breast with red and yellow peppers, chillies and sesame seeds. Chiuchow or Teochew cuisine, from Guangdong Province is well known for its seafood dishes, braised pickles and light flavouring and freshness of ingredients. To accompany our main dishes we had stir-fried choi sum with garlic (£9.80). The crunchy green stems were delicious and added some lightness and freshness to our meal. To wrap up, we shared some seasonal mooncakes, a delicacy gifted between family and friends to celebrate Mid-Autumn Festival, a Chinese holiday dedicated to viewing the moon at its fullest and brightest at this time of the year. Royal China Queensway will be serving these beautiful treats decorated with symbols of prosperity and friendship during the whole of September. Our first mooncake was made of a thin layer of reddish-brown pastry encasing a deliciously sweet and dense lotus seed paste filling. A whole salted egg yolk is placed in its centre to symbolise the moon. The cake is rich and you will only need a small wedge to savour with tea (£4.00 for 2 types of cakes). Our second mooncake was a smaller version made with a white crumbly pastry filled with egg yolk custard. If we weren’t so full already we could have eaten a few of these! 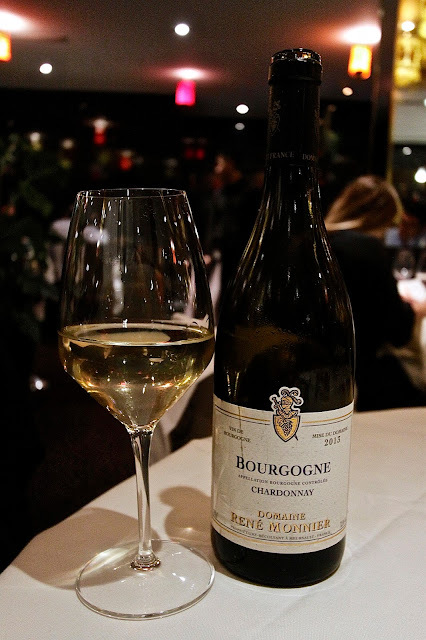 What We Drank: Our choice was a bottle of Domaine Rene Monnier, Bourgogne Chardonnay, 2013 (£26.00) which was a rich and rounded wine with a lovely hint of vanilla and a touch of acidity on the finish – a fine chardonnay at its price. Likes: The delectable soft-shell crab with salty and spicy flakes was a dish I would happily order again, as well as the baked seafood rice with Portuguese sauce which is an perennial favourite and worthwhile asking for despite it not being on the menu. The mooncakes were rich but a perfect afternoon treat or dessert with a lighter meal. Good wine selection and very well priced. Excellent dim sum. Dislikes: The service at Royal China Queensway is efficient but can be less than friendly at times, which is a pity for a restaurant of this quality. The prawns with red chilli sauce were sweet, lacking in heat and not representative of Szechuan cuisine. Verdict: The Royal China has been one of my favourite Chinese restaurants in London since its opening in 1996, and continues to be so nearly 20 years later. London restaurants come and go, but over the years, Royal China has been consistently reliable in what they offer – great dim sum and Cantonese fare. Recommended.